Love Me Do (live, w/”Jean Genie,” 1973). Love Me Do (live, w/”Jean Genie,” 1974). Love Me Do (live, w/”Jean Genie,” 2000). In the late summer of 1972, when David Bowie was becoming a pop star, he would throw The Beatles’ “This Boy” into the occasional Ziggy-Spiders From Mars set. One of The Beatles’ first B-sides (for “I Want to Hold Your Hand”), “This Boy” was their attempt at ’50s doo-wop (also inspired by early Miracles records, especially in its bridge), with its close three-part harmonies and rickety 12/8 time. Bowie mainly sang it solo, with Ronson coming in for occasional harmonies. Surfacing amidst the Ziggy Stardust numbers, “This Boy” seemed like a lullaby suddenly recalled from childhood, Bowie offering the crowd a memory. The following summer, a gaunt, weary Bowie, with his blood-orange mullet and his Japanese lounging robes, made his final tour of Britain as Ziggy Stardust. He had sold the world and now he was resigning. In some of the last Ziggy shows, the Spiders extended “The Jean Genie” for over ten minutes, teasing it out, and, cued by Bowie’s harmonica, often segued into “Love Me Do.” It was an expedition to find the source. “Love Me Do,” the first Beatles single, was a raw, modern record upon its release: it was pure expectation and promise. At the final Ziggy show, Bowie sang “Love Me Do” simply, letting his audience finish the chorus, then crept back into his own song. The show ended, Bowie broke up the band and, looking for an escape route, burrowed into the past. “This Boy” was played in a few ’72 shows, with the murky recording linked above from a 27 August concert in Bristol. “Love Me Do” appeared throughout the last Ziggy Stardust UK tour, including the last-ever Spiders show at the Hammersmith, on 3 July (it was cut from the concert film, either due to Jeff Beck’s resistance or copyright issues). Bowie also threw “Love Me Do” into “Jean Genie” performances during his 1974 tour and again in 2000. 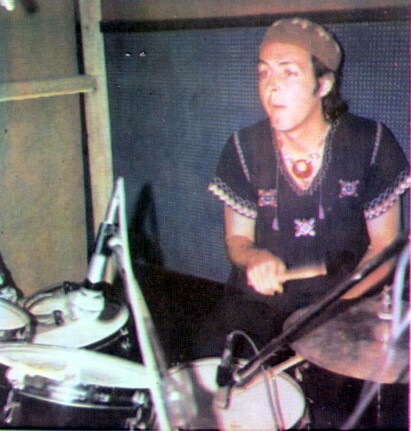 Top: Paul McCartney, Band On The Run sessions, Lagos, Nigeria, ca. September 1973.